I wasn’t able to locate a complete diagram for SRM that included both the various services PLUS the communication ports, all rolled up into a deploy-able topology, so I took it upon myself to gather the information I needed, and build something that would work for me as a reference tool as well as a conversation piece. 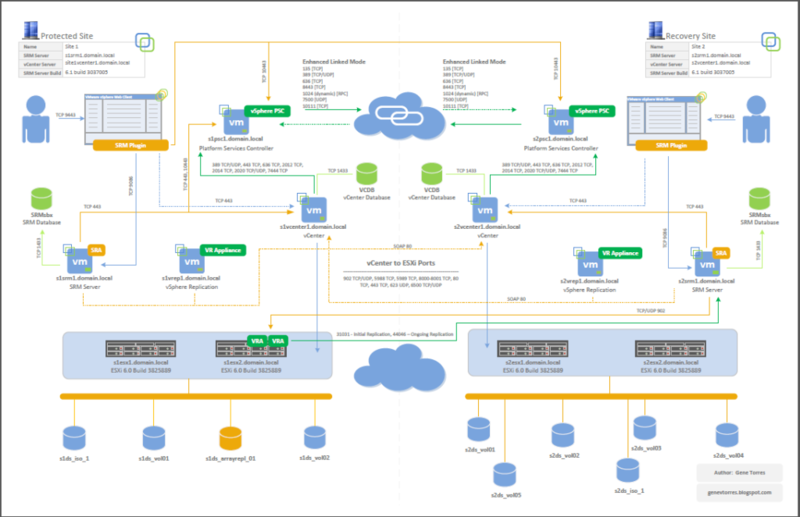 The design seen is an actual POC design I’m working with in a live enterprise network (sandbox vCenters and clusters). The result of it all is a topology diagram with vSphere and SRM ports and protocols baked right into it. If you are interested in obtaining a PDF version of this diagram, click here. what stencils did You use? Hi Oskar, I was looking for some decent looking 2D stencils and couldn’t find any I liked, so I just made my own.